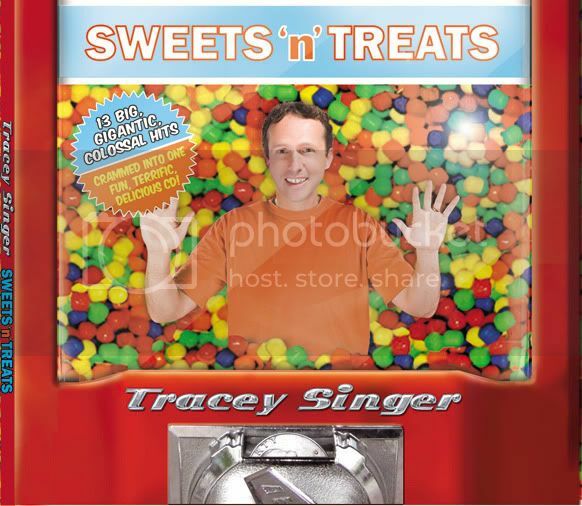 San Diego-based singer-songwriter Tracey Singer’s will be debuting his children's CD , Sweets ‘n’ Treats on July 7th! The disc, produced by two-time GRAMMY® nominee, children’s musician Buck Howdy (also heard singing backup), features 13 Tracey Singer originals, largely inspired by grand family adventures as work-at-home dad to four children under age nine. Introducing such memorable characters as Foxy Joe, Hard-Hearted Haley, and the remarkable Mall Mom, with song styles ranging from old time rock ‘n’ roll (featuring Marc Intravaia’s blazing electric lead guitar solo) to close harmony vocals reminiscent of late ‘40s Andrews Sisters (backed by the sweet and soulful sounds of the album’s resident soprano saxophonist, Tripp Sprague) Sweets ‘n’ Treats is much more than a simple, happy, pop music romp. Tracey’s wit and style shine through this album filled with sophisticated harmonies and intelligently crafted compositions. Tremendous attention to detail has resulted in such special touches as the inspiring contributions of multi-instrumentalist Dennis Caplinger, who offers brilliant work on acoustic guitar, electric guitar, banjo, mandolin, dobro, fiddle, and jaw harp. 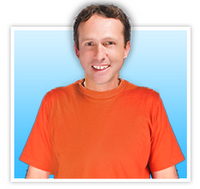 About Tracey Singer:The fact that children’s singer Tracey Singer (yes, it’s his real name) is a stay-at-home dad/musician does not set him apart from the multitudes of performers who juggle songwriting, performing and studio work with full-time parenting. What does make his story different is the fact that he is an MBA who traded a good management position with a Fortune 100 company and the excitement of the climb up the corporate ladder for a life of music, diapers, runny noses and the chaotically fun lifestyle that comes with raising 4 children – all under the age of 9! Sweets 'n' Treats will be available starting TODAY July 7, 2009 for $15 (Run time: 40 min). You are able to buy it from www.traceysinger.com, cdbaby.com, amazon.com, and iTunes. Winner has been emailed , you have 48 hours to reply. I teach kindergarten. My students would love this!! The music is really engaging for little ones! cute songs, I especially liked "Where Did the Summer Go?" All kids going back to school in Aug. have that question. I like the "fun" stuff but I am glad to see that they can do a good job with quiet songs such as A Toddler's Lullaby. I think my sons would love it! Very cute songs! good beat, my daughter would love this! Very fun, happy music. I especially like Mall Mom. I love this! I would use it with the students I teach and for my own kids when I have them! I enjoyed listening to Sweets 'n' Treats. I especially liked Camping Trip.